The Uniform Trust Code ("UTC") is the first comprehensive codification of the law of trusts. Approved in 2000 by the National Conference of Commissioners on Uniform State Laws, the UTC has since been enacted (sometimes in modified form) in at least a dozen jurisdictions. The UTC has not been without controversy. In particular, Article Five of the UTC - concerning creditors' rights - has generated a veritable war of words, with opponents claiming that enactment of the UTC will result in dire consequences to the traditional creditor-protection benefits associated with spendthrift and discretionary trusts. The purpose of this article is to examine Article Five and the controversy it has engendered. Part I of the article offers some background about the UTC and its development. 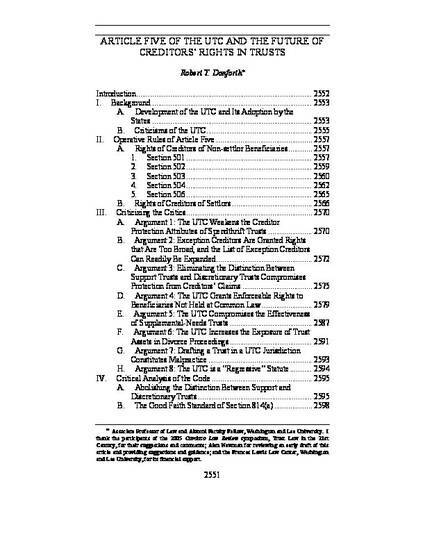 Part I also describes, in summary fashion, some of the controversies that have surrounded the UTC - including the controversy over Article Five - and explains how these controversies have, in some cases, inhibited adoption of the UTC by the states. Part II examines the operative rules of Article Five; the purpose of Part II is to set up the discussions in Parts III and IV. Part III of the article examines and responds to the critics' principal assertions about Article Five. Part IV offers a normative analysis of particular elements of Article Five and makes some modest suggestions for reform. Robert T. Danforth, Article Five of the UTC and the Future of Creditors' Rights in Trusts, 27 Cardozo L.Rev. 2551 (2006).